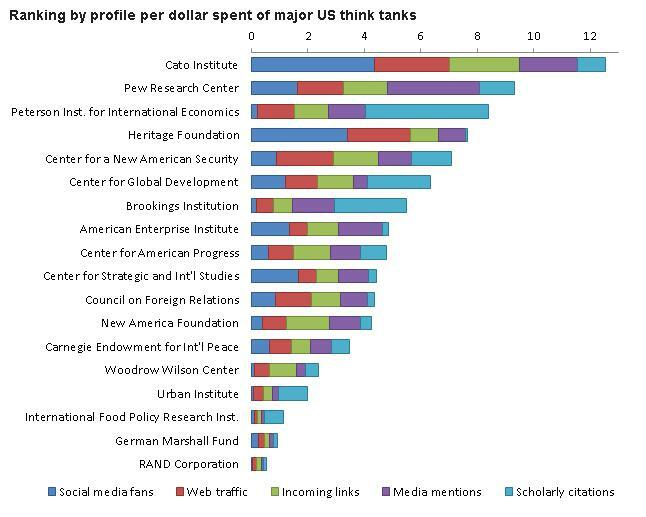 Can You Name America’s Most Effective Think Tank? What’s the best think tank in the United States? I’m obviously not impartial since I work at the Cato Institute, but here are a few relevant pieces of information. When Obama first took office and faced very little opposition, the Cato Institute took the lead against the faux stimulus, rallying hundreds of economists (including Nobel laureates) in opposition to the White House’s primitive Keynesianism. The legal argument for restoring the Constitution’s restraints on federal power has been driven by the intellectual work of Cato Institute scholars and adjunct scholars. In the battle against Obamacare (as well as the battle against its evil twin, Romneycare), the Cato Institute has been the most dogged, most principled, and most effective fountainhead of ideas and strategies. But you don’t have to believe me. The Center for Global Development has just released new research showing that the Cato Institute is America’s most productive and effective think tank. The CGD’s calculations on based on hard data, looking at how much organizations spend and comparing that to their success with social media, web traffic, links, media exposure, and scholarly citations. As you can see, the Cato Institute has a comfortable lead over other think tanks. Much of the credit for Cato’s success belongs to Ed Crane, who founded the organization more than 30 years ago and presided over its growth until his retirement last year. Under Ed’s leadership, Cato became a major factor in public policy debates. Some say this is because he had a good senior team and hired good people. All that is true (at least I hope since he hired me), but I think another key factor in Cato’s success is that there’s never even the slightest suggestion that what we say and do is influenced by politics. People can disagree with Cato because they object to limited government and individual liberty, but they always know it’s the place to go for honest and principled analysis. And that makes me a very lucky guy. Every day, thanks to Cato, I get to fight against wasteful, bloated, and corrupt government. P.S. While we’re proud of our top performance in the CGD ranking, Cato came in second place in the 32-team DC think tank softball league, losing in the championship game of the tournament, so we know there’s room for improvement. Texas is in much better shape than California. Taxes are lower, in part because Texas has no state income tax. No wonder the Lone Star State is growing faster and creating more jobs. And the gap will soon get even wider since California voters recently decided to drive away more productive people by raising top tax rates. But a key challenge for all governments is controlling the size and cost of bureaucracies. Government employees are probably overpaid in both states, but the situation is worse in California, as I discuss in this interview with John Stossel. But being better than California is not exactly a ringing endorsement of Texas fiscal policy. A column in today’s Wall Street Journal, written by the state’s Comptroller of Public Accounts, points out some worrisome signs. As the chief financial officer of the nation’s second-largest state, even I have found it hard to get a handle on how much governments are spending, and how much debt they’re taking on. Every level of government is piling up incredible bills. And they’re coming due, whether we like it or not. Even in low-tax Texas, property taxes have risen three times faster than the inflation rate and four times faster than our population growth since 1992. Our local governments, meanwhile, more than doubled their debt load in the last decade, to more than $7,500 in debt for every man, woman and child in the state. In Houston alone, city-employee pension plans are facing an unfunded liability of $2.4 billion. But too many taxpayers aren’t given the information they need to make informed decisions when they vote debt issues. Recently I spent several months holding about 40 town-hall meetings with Texans across our state. Each time, I asked the attendees if they could tell me how much debt their local governments are carrying. Not a single person in a single town had this information. In other words, taxpayers need to be eternally vigilant, regardless of where they live. Otherwise the corrupt rectangle of politicians, bureaucrats, lobbyists, and interest groups will figure out hidden ways of using the political process to obtain unearned wealth. P.S. The second-most-viewed post on this blog is this joke about Texas, California, and a coyote, so it must be at least somewhat amusing. If you want some Texas-specific humor, this police exam is amusing and you’ll enjoy this joke about the difference between Texans, liberals and conservatives. And if you want California-specific humor, this Chuck Asay cartoon hits the nail on the head.